It is our great pleasure to announce the start of a project which will help to mark the beginning of a new chapter in the story of Strollers Theatre. Strollers has seen drastic changes in recent years. A number of long-standing members of the executive board and others who have been integral to the operation of our community theatre group have stepped down from their previous roles. While the newly elected executive board (including those whom you elect at the upcoming Spring Membership Meeting) will continue to uphold the fine tradition of quality theatre that has been Strollers’ hallmark for decades, we also wish to recognize the history of our company and the giants upon whose shoulders we stand. To get involved, email Lucas directly at lsevedge@gmail.com to get involved right away! 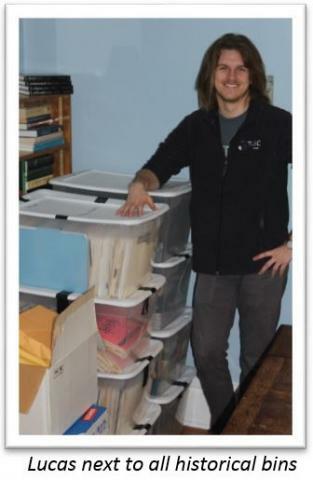 The goal of this project is to digitally and physically preserve the literally tens of thousands of photographs, documents, letters, news clippings, reviews, drawings, and notes that have been created by and for our company since Strollers Theatre first began in 1958, and to make them publicly available online. We have already created over a thousand high-quality scans of some of our oldest documents, including a copy of Strollers’ (at the time, The St. James Players’) very first show program, for the 1958 production of Stardust. We also have special plans to use some of our most interesting and historically significant artifacts for future projects.